Activists in Australia have expressed concern over a recent decision by the government to reinstate the processing of asylum seekers offshore. “This policy will see asylum seekers sent to Nauru [in the Pacific] or Manus Island [Papua New Guinea (PNG)] before having their refugee status assessed in a move Australia hopes will circumvent its international human rights obligations,” Benjamin Pynt, the director of Humanitarian Research Partners, based in Australia, told IRIN. Currently 386 people are awaiting processing of their claims on Nauru, with another 47, including 16 children, on Manus Island, which reopened its doors on 21 November. Most asylum seekers on Manus are Sri Lankan and Iranian, while Nauru has mainly people from Afghanistan, Sri Lanka and Pakistan, with smaller numbers from Iraq and Iran. On 15 August, the government returned to offshore processing in both locations after abandoning it in 2007, following heavy criticism by human rights groups. Close to 1,500 asylum seekers were processed on Nauru under the previous government’s Pacific Solution, with another 365 on Manus. However, conditions in the two facilities are far from good. Described as “totally inappropriate and ill-equipped”, the facility reportedly had hundreds of men crammed into five rows of leaking tents and suffering from physical and mental ailments. Current capacity in Manus and Nauru is 500 people on each island. However, upon completion, the combined capacity will exceed 2,000, the government says. “Offshore processing on Nauru and Manus Island will only serve to break vulnerable people in these ill-conceived limbo camps, who have fled unimaginable circumstances,” said Graham Thom, the national refugee coordinator at Amnesty International Australia. The watchdog group has called on the government to immediately cease transfers to Nauru - a move it sees as penalizing people for seeking asylum. “These people are taken to a country, detained, and told if they don’t like it they can go home,” Thom said, recalling the story of one Iraqi man who, if returned to Iraq, would have no choice but to flee to Turkey with his family. “There is no option for most of these people,” the Amnesty official said. According to Canberra, the government’s recent policy response to an issue that has preoccupied officials and the public for years is simply an attempt to tackle the growing problem of boat arrivals. More than 30,000 people have made their way to Australia by boat since 1976, according to Australia’s Department of Immigration and Citizenship. Each year scores of people travelling in overcrowded, dilapidated boats lose their lives on the high seas in an effort to reach Australia, often just off the coast of Indonesia. In 2011, 69 boats carrying 4,565 passengers arrived in the country, while as of 30 November, 256 boats carrying 15,910 passengers had arrived in 2012, the immigration department reported. Since 2010, the government of Prime Minister Julia Gillard has sought to renew an offshore processing system for boat refugees and introduced the prospect of swapping refugees with other countries in the region. In 2011 the High Court ruled against the Malaysia Solution where Australia would effectively send 800 boat arrivals to Malaysia in exchange for accepting 4,000 refugees currently in Malaysia over the next four years. When the return to offshore processing was announced in August, Chris Bowen, Australia’s minister for immigration and citizenship, said the policy would “discourage irregular and dangerous maritime voyages,” and “promote the maintenance of a fair and orderly refugee programme”. Under the policy, the government adopted the “no advantage” principle, which effectively means all asylum applications will be processed in the same time period as those elsewhere, including those in neighbouring Indonesia, and regardless of whether they had arrived in Australia or not. “People arriving by boat are subject to this `no advantage’ principle, whether that means being transferred offshore to have their claims processed, remaining in detention, or being placed in the community,” Bowen said in a statement. “Consistent with `no advantage’, people from this cohort going on to bridging visas will have no work rights and will receive only basic accommodation assistance, and limited financial support,” Bowen said. But despite the government’s position, activists remain concerned. 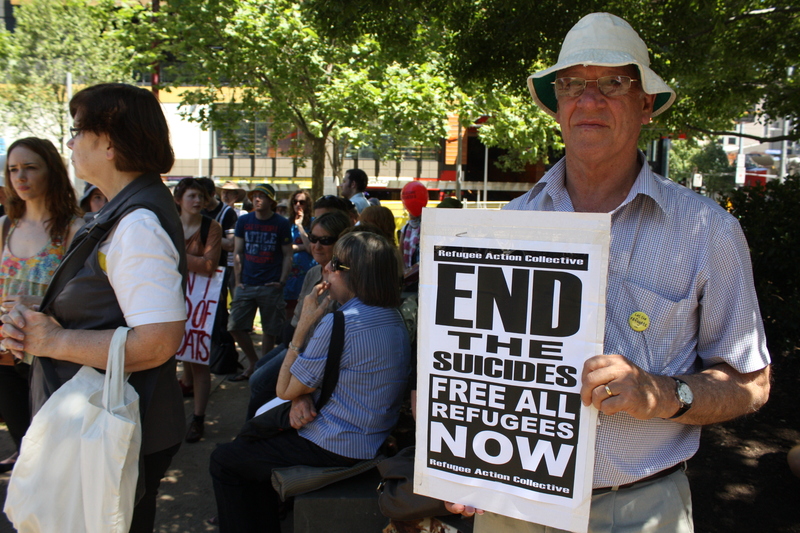 “The Australian government must remain focused on building a regional refugee protection framework and it must meet its responsibilities as a signatory to the Refugee Convention,” Paul Power, chief executive officer of the Australian Refugee Council, told IRIN, saying the recent changes to the country’s asylum policy were “disheartening, unfair and set a poor example for refugee protection in the Asia region”. More than 7,000 asylum seekers are in immigration detention facilities and alternative places of detention in the country, including hundreds of children, the country’s Department of Immigration reported. “The government claimed all asylum seekers would be treated the same, but a small number are being sent to Manus Island and they are being persecuted with different detention and conditions to those asylum seekers released in Australia,” said Ian Rintoul, a spokesman for the Refugee Action Coalition in Sydney. Meanwhile, Human Rights Watch (HRW) says the transfer of children for offshore processing of refugee status needs to be addressed immediately. Australia’s policy violates its obligations to children under the Convention of the Rights of the Child, which protects all children in Australia’s jurisdiction, including children of non-citizens, it said. “Migrant children are often survivors of traumatic journeys to reach Australia,” said Alice Farmer, a children’s rights researcher with HRW. And then there is the whole question of legality. Legal experts say the recent decision to return to the offshore processing of refugees is a violation of the international conventions and treaties to which Australia is a signatory, including the UN Refugee Convention. “This is a total derogation of Australia’s responsibility as a signatory to the Refugee Convention and human rights treaties,” said Susan Kneebone, an international expert on refugee law based at Monash University, describing it as Australia’s lowest point in its treatment of refugees. “UNHCR is deeply troubled that as long as the focus remains primarily on deterrence, the humanitarian, ethical and legal basis of asylum, and the protection of refugees, will be seriously undermined,” said UNHCR regional representative Richard Towle on 23 November. All asylum-seekers in Australia, including those transferred to PNG and Nauru, must be given a full, fair and expeditious assessment of their refugee claims as soon as possible, it said. Those found to be refugees should be given basic human rights and the rights to which they are entitled under the Refugee Convention, including family reunion, work and freedom of movement. Those found not to need protection can be expected to leave the country, the statement said. UNHCR is particularly concerned about the decision to transfer families, including children, to Manus Island, in the absence of any adequate legal framework, procedures or resources in PNG to assess their claims. "The current movement of refugees and asylum-seekers raises many challenges for states but we encourage Australia to ensure a humanitarian approach that is fully compatible with the Refugee Convention,” Towle said. UNHCR’s preference remains that all people arriving in Australia be assessed in Australia under fair, efficient and, as needed, robust asylum procedures.